Desert Dreams Video Slot Guide & Review - Casino Answers! Desert Dreams is a 5-reel, 20-line video slot from Cryptologic, featuring wild symbols, scatter wins, multipliers and a free spins feature. You can play the Desert Dreams video slot at InterCasino and Casino Joy. Desert Dreams is a archaeological video slot set in the Sahara in Egypt. The symbols in the video slot consist of both Egyptian treasures and digging equipment, along with some other things you will find in the desert. The symbols include an Explorer (wild substitute symbol), a Scattered Sarcophagus, a digger, a lady, a camel, a pickaxe, a shovel, an ankh, a compass and more. The symbols all have a cartoonish style to it, which adds to the fun factor of Desert Dreams. To play the Desert Dreams slot game, you must first set your bet at $0.01, $0.02, $0.03, $0.04, $0.05, $0.10, $0.15, $0.20, $0.25, $0.50, $0.75, $1, $2, $3, $4 or $5 per line. Desert Dreams gives you a lot of betting options, as you can see. You can also modify the number of active paylines from the maximum of 20. The range of the total bets on the Desert Dreams slot goes from $0.01 up to $100, which will suit any slots player who isn’t a billionaire, incredibly eccentric or hopefully both. If the game is too slow for you, there is a speed control with three settings: Normal, Fast and Very Fast. To play Desert Dreams with all 20 paylines active, use the “Bet Max” button or use “Spin” to play with your own bet. 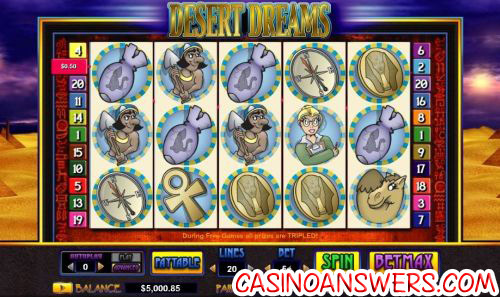 To win the 4000 coin top jackpot on Desert Dreams, you must hit 5 Explorer symbols on an active payline. The Explorer symbol is the wild symbol and will substitute for all symbols except for the Sarcophagus scatter symbol. The second highest paying symbol on the video slot is the Lady symbol at 2000 coins. Desert Dreams’ scatter symbol is the Sarcophagus symbol. It will pay out 1X for 2 symbols anywhere on the reels all the way up to 100X for 5 symbols. 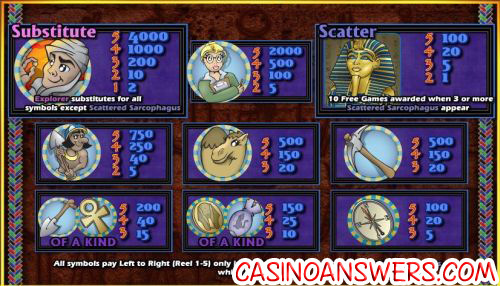 If you hit 5 Scattered Sarcophagus symbols, you will be awarded 10 free spins with a 3X multiplier, meaning all wins in the free spins feature will be tripled. The free spins feature can be re-triggered. Free spins are played at the paylines and bet of the triggering spin. Free spin wins are added to payline and scatter wins. To use Desert Dreams autoplay feature, look for the “Autoplay” box and hold down the right arrow to play up to 999 autoplay spins. If you wish to use its advanced settings, hit the “Advanced” button to open the additional settings. You will be able to set your stop conditions, including: cumulative win (up to $5000), cumulative loss (up to $5000), single win of (up to $5000) and completion of the free spins feature. You may cancel the autoplay feature at any time by using the “Stop Autoplay” button. Desert Dreams may not have the most special features you can find in a video slot. It doesn’t even have a high top jackpot. What it does have is a fun theme and a good free spins feature. If that’s what you are looking for in a video slot, get your $225 signup bonus to play Desert Dreams and nearly 200 other casino games now at InterCasino! Can players from the United States play the Desert Dreams video slot for real money? Unfortunately, Cryptologic online casinos are not accepting players from the USA at this time. If you are looking for an Egyptian-themed slot machine that is US-friendly, you can read our Pharaoh’s Gold Slot Machine Review or you can play it now at Bovada Casino. Where can I play a Flash game of the Desert Dreams slot? If you have a Mac or choose not to download the casino software, you can still play the Desert Dreams video slot at InterCasino using their Instant Play option. If you experience any issues playing the Desert Dreams slot game on Flash, try downloading the latest version of Adobe Flash Player.